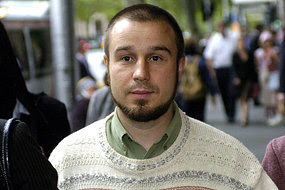 Retrial ordered: Jack Thomas outside court in Melbourne in March, 2005. On Monday, the 35 year old man from Werribee was ordered on to face a retrial on charges of accepting funds from a terrorist organisation and possessing a falsified Australian passport. But his lawyer Jim Kennan SC says he will be seeking leave to appeal to the High Court. The matter returns to court next month.